SWIFT has been too slow to implement blockchain, but it’s better to be late than sorry, as seen by R3 partnership between the companies. QuadrigaCX founder passes away and the company loses access to cold wallets. South Korean conservative party to leverage blockchain for better party management. LocalBitcoins.com founder Michell Espinoza back on the bench for money laundering following new understanding of Bitcoin and cryptocurrencies by Florida’s laws. Startup to help cryptocompanies become legally compliant from day one, and stay compliant. 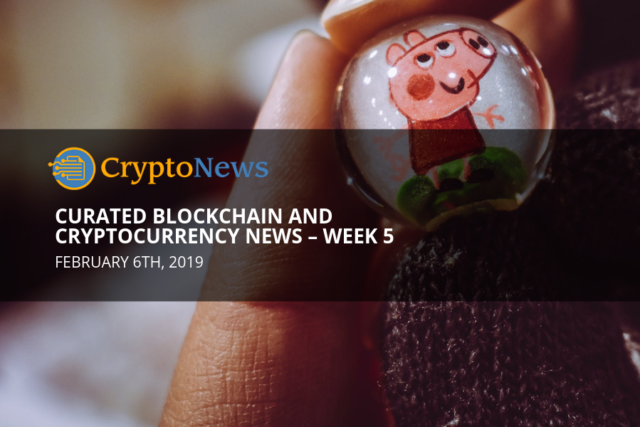 Kraken makes another crypto-related acquisition, this time in the U.K. Google builds upon their blockchain and cryptocurrency data tools by adding six new cryptocrrencies to the mix, and more stories await you in this week’s curated blockchain and cryptocurrency news. Bitcoin’s price has lost and recovered value this week, keeping the volatility meter in check, but in Bitcoin terms, it has been a rather stable week, with no massive growth or losses being recorded. The week started with Bitcoin at the $3483 mark, and ended at the $3469 mark. 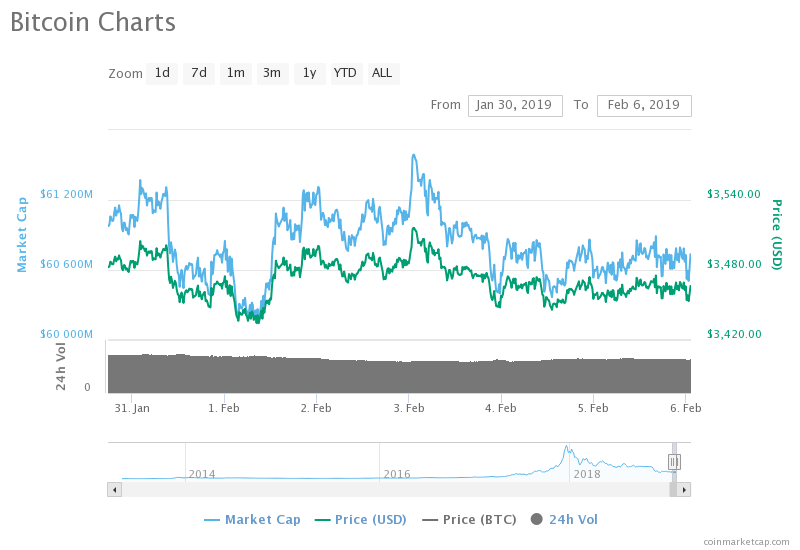 This week seems to be affected by news with QuadrigaCX’s exchange story breaking on the 31st of January, shortly followed by a dip in Bitcoin’s price. However, it has recovered on speculative grounds as there were no strong events to warrant the comeback on the 2nd of February. Since then it has been slowly bleeding off minimal parts of its value, but as mentioned before, the situation seems pretty stable. While the impact of the blockchain implementation in SWIFT (at this moment) is minimal, the importance of this story comes from the fact that SWIFT has committed to utilizing the technology at all. You see, the giant payments processing company does not really need blockchain. They represent the fundamental framework on which the financial world has operated on for the past 30 years and they are moving more than $200 billion every day. Having them utilize blockchain means that they see an actual risk of losing out on business due to technological progress and they don’t want to be left behind. Swift’s solution is based on providing fast fiat settlement for banks and according to their press release, all of R3 Corda blockchain applications. We have yet to see what the implications and effects of Swift’s and R3’s decisions are going to be, but the general expectation is that they are going to result in a better experience for both owners and users of said applications. “Til death do us part” was the unexpressed phrase between QuadrigaCX’s founder and $190 million worth of digital assets that were entrusted to the exchange. Canada’s largest cryptocurrency exchange has suffered tremendously and everyone involved is currently scrambling for a solution. The event may result in new legislation being pushed through to prevent incidents such as these happening in the future. 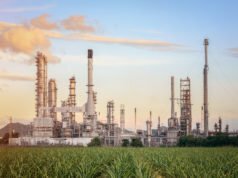 There are a few problems as it seems that some of the assets they claim are inaccessible have been moved, providing evidence that points to the contrary. Other exchange operators, including Kraken’s CEO have claimed that such security oversights would be unthinkable, as recently reported by CryptoNews. The founder who passed away while travelling in India failed to establish a protective layer in case of his death. This was not the case with his will, which was enacted just a few days before his passing. The timing of the will also raises many questions that point to foul play, and as this is a developing story, CryptoNews’ own Trevor Smith will be following the developments. South Korea is one the fore-front of blockchain technology and this is obvious in the amount of daily trade volumes visible on the country’s cryptocurrency exchanges. Now, they are breaking new ice, with the second-largest conservative party in South Korea, the Liberty Korea Party (LKP), announcing that they will implement a blockchain solution to communicate and manage their 3 million large membership. South Korea has been adopting more and more of blockchain technology to improve the fairness and transparency of administrative and political systems. The rest of the world is slowly accepting cryptocurrencies and adding them to their legislation, while South Korea is spearheading forward by implementing blockchain at the core of its society. 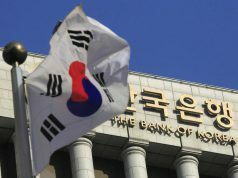 Other countries around the world are going to keep a close eye on how the situation is developing in South Korea, while they are evaluating whether or not blockchain is a good idea for them. Whether we like it or not, positions in power offer individual the opportunity to sacrifice ethics and morality and indulge in foul play. Governments that do not adopt a blockchain system for transparent communications with citizens most likely have something to hide. Recent changes in the understanding of Bitcoin may bring back a case that failed in getting the defendant to prison two times since 2016. In the past Florida courts did not consider Bitcoin to be money, or to represent a system for the exchange of value. Today however, the understanding is different, and it does not help LocalBitcoins.com founder Michell Espinoza. While the court does not explicitly state that Bitcoin is money, it does describe cryptocurrencies as a payment instrument under Florida’s law. Espinoza’s case has been remanded for future proceedings where he might be finally penalized for enabling the trade of Bitcoin. The case will be fundamental in forming the regulatory expectations in Florida in regards to Bitcoin and whether trading it constitutes money transmission. Espinoza has been charges with two counts for money laundering and one for acting as an unauthorized money transmitter operator. LocalBitcoins is a very popular website used by thousands of people around the world to connect with buyers and sellers of Bitcoin. Espinoza’s role as the founder is as distant as possible from the actual trades, but in this case he is an enabler. Regulation is a big deal, with many companies that want to bet on the long run depending on adhering to all of the rules and regulations poised by the governments and authorities. Blockchain Capital and other investors have bet $1.7 million on the fact that most cryptocurrency startups will find adhering to regulations confusing and difficult, through their investment in Token Relationship Management Labs. The startup will offer other companies in the space access to their RegTech, enabling companies and exchanges to be fully compliant from day one. In addition they are offering more tools to help segment and evaluate the market for their token, understanding users and knowing where to double down in the ecosystem. From our perspective the biggest benefit is that companies are able to delegate their regulatory compliance by having a partner that is responsible for their company’s legal standing. Will the Lunar New Year affect the cryptomarkets in China? What is being touted as the largest deal in the ecosystem has subsequently led to Kraken receiving a $4 billion valuation, landing it safely in the “crypto unicorn land”. Kraken obtained the ownership of London’s Crypto Facilities a Bitcoin futures and derivatives trading provider. Lawyers working on the deal have confirmed that it is the largest mergers and acquisitions deal that has happened in the ecosystem. Kraken has been rampaging on the business side of things since 2016, acquiring over 6 different cryptocurrency related websites and businesses. Jesse Powell, Kraken’s CEO, has not given any comment on the reasons why the company is making the purchase. It might be a way to buy-out the competition, or a way to buy-in a different business model, as Kraken did not offer any futures or crypto derivatives. The giant has taken a significant leap forward in terms of enabling blockchain developers an easy way to access cryptocurrency related data. Last year’s release that encompassed Bitcoin’s and Ethereum’s transaction histories received minimal amounts of media attention, as there was no real innovation. The blockchain is already doing the same exact work. They are equipping developers and data scientists with the tools to perform cross-chain analysis with all of the data being accessed through this single entity. The tools on hand are going to enable machine learning experts the most, by providing them with data to fuel their decision making models, whether they are creating a trading bot, calculation, or a prediction mechanism for any of the supported cryptocurrencies. 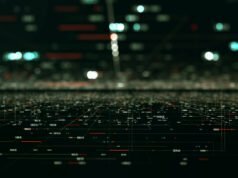 For the first time, it is possible to analyze cross-chain effects and influences as well as retro-actively calculating the profitability of trading moves. These are just few of the potential uses of the latest addition to BigQuery Public Datasets by Google. We are looking forward to seeing what kind of applications will be born in the minds of developers. Featured Images via Pexels and Unsplash. Market data from CoinMarketCap.